Today I went to Red Brick to work on this painting, and this is how it looked when I was ready to pack up and go home. (It is shiny because it was still wet when I photographed it.) I only had an hour available to work on this today, so I concentrated on the background. I made the color darker, moving it towards a brick red. I will work on the leaves next, especially if I get lucky and have a sunny day. Painting with oil bars is still quite a struggle, like trying to create an image with peanut butter and a butter knife. But I am really enjoying this and trying to learn as much as I can. To be continued. . . This image is from another photo that I took on yesterday's early morning walk around the pond at the Cummings Center here in Beverly. I cropped this image to focus attention on the trees and their reflections in the water. I took this photo this morning during an early walk at the Cummings Center. Although I have often driven past this path, I had never actually walked there. 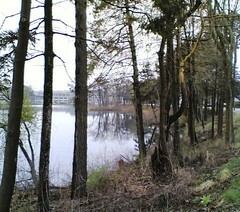 It was a nice walk, with views of the water through the trees. It is surprisingly easy to forget that you are walking in the middle of what is now an office park. Along the path, historical markers point out that you are walking along a riverbank that was important in the early days of Beverly and Salem. The misty morning weather was perfect for this little adventure. 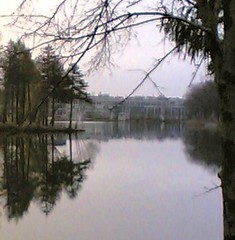 I loved the reflections of the trees on the water, so I took some pictures with my phonecam. Tonight I cropped this image to get the composition I wanted. I also opened it in Painter IX and used just a touch of digital pastel to cover a distracting bit of hot pink (someone's jacket off in the distance, perhaps?) Then I adjusted the contrast just a bit to emphasize the soft mist and morning light. Today I went back to Red Brick to work on this painting for an hour. It is a rainy and gloomy day, and because I had no sunlight on the still life set up, I decided to just work on the background. I started by making the color of the wall darker. This isn't the final color, but at least I can start to see what will happen as the contrast with the flowers increases. I added pink to the table because there are pink tones in the red I am trying to make. Right now, this is not the final color, either, but for now it helps to have more color contrast between table and wall. Here is another photo from last Sunday's Cambridge run. After coffee at Peets, I got to the COOP before it opened, so I walked around the block to kill time. 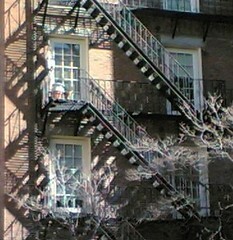 As I walked down Palmer Street, I noticed the back stairs at the Club Passim Building (47 Palmer). The stairs themselves have amazing iron patterns and the morning light was creating still more patterns with shadows on the brick wall. I liked the contrast with the spring trees, getting ready to bloom but not quite there yet. I took a picture with my phonecam. Last night I cropped the image until I got the composition I wanted, and here it is. I have been really busy today, but managed to get to the studio to work on this painting for an hour. First I made the vase narrower. Then I made the background darker and started adding definition to the flowers and creating more negative space around them. Then I did a little work on the leaves, but by then it was time to pack up and go home. To be continued. . . This is a photo that I took in Cambridge on Sunday. The weather has been great, with some very warm days. It is always fun to visit the bookstores in Cambridge, but this time, the weather was too fantastic to spend so much time inside so I decided to take a walk on Harvard's campus. 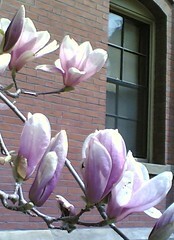 During my walk, I saw this magnolia tree in bloom, and I liked the way it looked against the red brick, so I took some photos with my cell phone camera. 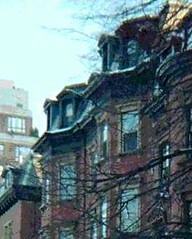 Tonight I cropped the image to get the contrast of the soft blossoms with the geometric patterns of brick and windows. 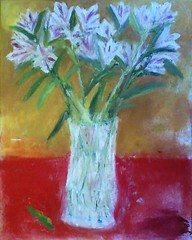 This morning I went back to Red Brick and worked on this oil bar still life. I could only paint for an hour today, so I concentrated on adding white to the flowers, to define the shapes of the blossoms. 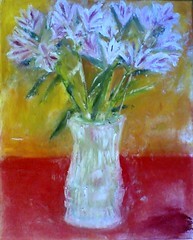 Then I began adding white to the vase, to begin to define its shape and to try to create the texture of the glass vase. The hour went quickly, not only because I was having fun (which I was), but also because painting with oil bars is new for me and a big challenge. When it was time to leave, I could already see things I wanted to change, but they will have to wait till next time. To be continued. 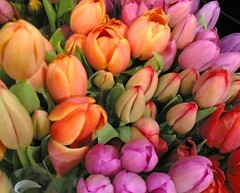 . .
During a grocery store run this weekend, I passed the display of tulips in the flower section. It looked like a fiesta, so I stopped to take some photos with my phonecam. Here is the best one. This is the oil bar painting I started yesterday. I really only had an hour to spend at the studio yesterday, but I got very involved in the painting and forgot the time, so I would say I was painting for an hour and a half, maybe a bit more. 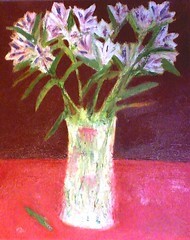 Basically I was just able to block in the rough placement of vase, flowers, and background. The colors will change a lot by the time this is finished. When I am laying out the composition or making changes in a painting, I sometimes use high color contrast to make it easy to see where things are. 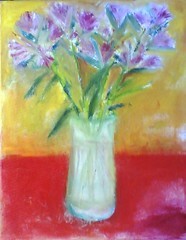 It is easy to get tangled up in leaves and stems when painting a vase of flowers, and I thought the yellow would provide higher contrast than brick red, just for now. I am new to oil bars and it is quite a struggle. I am using a palette knife which gives me much less control than I am used to with a brush, and I am also struggling to mix the colors by mashing up pieces of the oil sticks or mixing the colors right on the canvas. But it is quite an adventure and I am learning a lot. Afterward, it was plain to see that I had enjoyed myself; I came home with orange paint all over my black sweatpants, and bright yellow paint on my face. But I had a great big smile on my face as well. 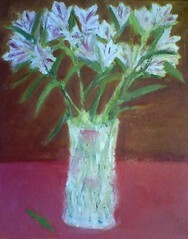 Today I went to Redbrick, and I took this vase of freesia with me to paint. I set up the still life, and took a picture of it with my phonecam to use as a reference, and to post along with my progress on the painting. I like the photo for its own sake, so I cropped it a bit for the composition and am posting it here first. I did get the oil bar painting started today as well and will start posting it tomorrow. The weather finally seems to be improving, with sun and blue skies and fifty degrees. Now we can find tulips outside in planters, and I will take them where I find them. Yesterday I saw these when I was leaving a restaurant with my son. I stopped to take a quick picture with my phonecam, then later cropped the photo to get this composition. 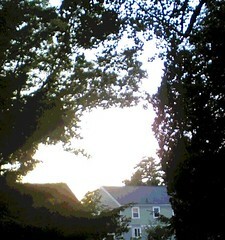 This began as a phonecam photo of the fading light of evening. In the original photo, the contrast of light and dark didn't really work well. Tonight I opened the image in Painter IX and tried several levels of posterizing till I had the effect I wanted. 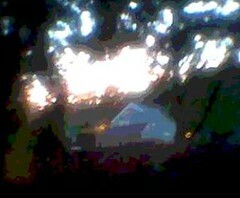 Then I cropped the image to focus on the soft evening light seen through the lacy shadows of the trees. 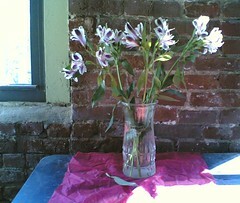 During this morning's trip to the supermarket, I bought some flowers, purple and white freesia. 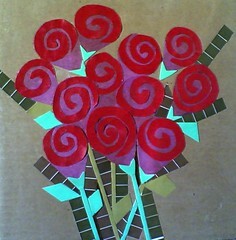 I plan to take them to the studio at Redbrick in a day or two, to paint or draw them. 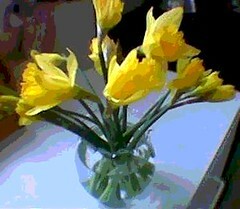 Meanwhile, the flowers look nice on the table, so I took some pictures with my phonecam. Tonight I cropped this image a bit, then posterized it in Painter IX, and used some digital pastel to cover up a few distracting marks in the background. This image began as a photo taken a couple of years ago with my old phonecam. This hurricane lamp was on the table at the Crescent City Diner in Dover, New Hampshire. I went to a dinner there, and it was odd to go to a New Orleans style bistro in New Hampshire. (It has since gone out of business, unfortunately.) The food was great, but this was post-Katrina, and it was too sad for me. 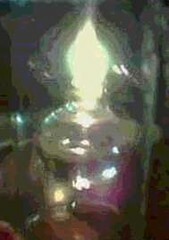 I was watching the hurricane lamp and decided to take some pictures. Of course the candle in the dark room overpowered my old phonecam and the images weren't really usable. But tonight I came across the photo and thought it seemed to fit not just recent weather, but recent news. To make the photo work, I opened it in Painter IX and posterized it; then I re-posterized, and added a pale yellow color overlay for the flame. I wanted the flame to show up in the image. In places like New Orleans, hurricane lamps are a way to try to keep a flame from being extinguished by a powerful windstorm. And sometimes hurricane lamps actually work, but not always, not always. What I want to say tonight is life is fragile. Light a candle. This image began as a picture taken with my phonecam as we drove through Boston's Back Bay. Tonight I cropped the image and posterized it with Painter IX so I could post it in time for tomorrow's marathon. We are expecting bad weather for the race, but rain or shine, the race goes on (so they say), and rain or shine, Boston is beautiful. The weather has been too cold and the sky too gray for mid-April, even for Boston, and now a Nor'Easter is predicted for next week. Spring is inevitable, but sometimes it is hard to wait. 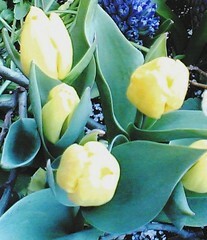 But during a weekend run to BJ's Wholesale Club to buy paper towels and coffee, I found these tulips, so I stopped to take some photos with my phonecam. Some may think that's impractical, but I disagree. Beauty can turn up anywhere, and it's ignoring it that's wasteful! I last posted this collage on February 13. At that point, I was thinking there was more that I wanted to do to the background. But the more I looked at it, the more I liked it as is. So today I went to Red Brick and put a coating of acrylic gel medium on it. So now it is officially finished and this is how it looks. Sometimes what you need to do to finish a piece of art work is just decide that it is finished. And sometimes that is the hardest and most important step in the process. 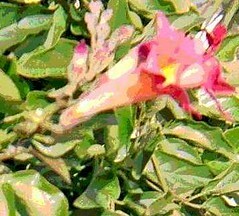 This image began as a photo taken last year with my old phonecam, which took low resolution images. I was trying to capture the way the freesia looked in the afternoon light, so I took several photos. But the strong light was too much for the camera. Although I liked the colors and composition of this shot, the image was too blurred to really use as a photo. Tonight I came across the image again, and decided to try posterizing it in Painter IX. I really like the result, so here it is. Sometimes I buy fruit because it is in season, or on sale, or required for a recipe. But sometimes I buy fruit because I love the way it looks. The other day I bought some Bartlett pears (yes, they are nutritious and were on sale). But I picked this particular pear out of the heap because of its beautiful color. It is gone now. (I ate it.) But not before before I took some photos of it with my phonecam. Tonight I cropped the photo to get it ready to post, and noticed a very faint purple ring on the counter. (Probably from a glass of grape juice or a jar of red horseradish, easily cleaned up with a little bleach in real life, but I was stuck with it in the photo and had already eaten the pear.) So I opened the image in Painter IX and cleaned up the image with digital airbrush. 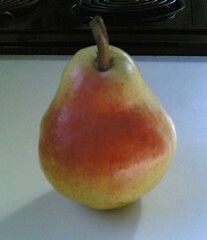 Although I have digitally enhanced my kitchen counter in this photo, I didn't do a thing to change this gorgeous pear. This is the collage I started a few days ago. I have been thinking about what to do with this little collage, and went back to Red Brick to try to solve several problems. The leaves didn't show up well against the background: I thought about painting the background a stronger blue, or outlining the leaves and stems, or adding a lattice of white paper for contrast. I wasn't sure that the colors in the four tulips worked well, so I thought about adding more tulips or a border that repeated those four colors. 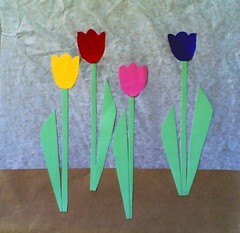 I started working by completing the tulips I had, just by adding one leaf. 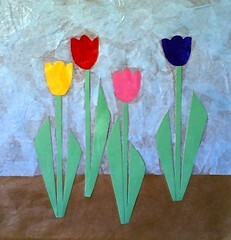 In doing that, I could see there was no room for more tulips or a border. I was about to tint some acrylic gel medium to change the background color, but then saw some more blue tissue paper. So instead I decided to apply another layer of blue tissue paper, tearing and cutting pieces of paper and "glueing" them down with gel medium. While I was at it, I put gel medium over the whole surface. The added layer of tissue paper changed the value and added enough color to contrast better with the leaves, and the slightly stronger blue improved the color scheme. I liked the added texture, and the coating of gel medium made the different kinds of paper go together better. I decided that I liked the piece well enough as it is here. More important, I (re-)discovered the technique of pasting layers of tissue paper down with gel medium, and I began to think about how I could create mountain landscapes that way. So even though I was at the studio for a short time, it was very time well spent, and I was smiling all day. I love to eat strawberries, but I also love the way they look! This image began as a photo taken with my first phonecam. (My current phonecam makes clear, crisp images, and it is great to always have such a reliable camera with me. 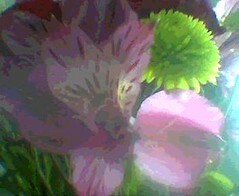 But I sometimes miss my first phonecam with its soft focus.) 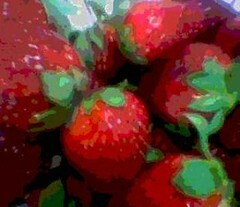 Tonight I took one of those soft images, a photo of strawberries, and decided to posterize it in Painter IX. I liked the effect, so here it is. Even though it was sunny today, here in Massachusetts the temperatures are still in the low thirties. If it hits forty degrees, it's a warm day! It is hard to wait for spring weather. But this image is a tropical souvenir from my trip to San Diego last month, flowers at Seaport Village, in bloom in mid-March! Tonight I cropped this image out from the original photo, and posterized it in Painter IX. This collage is a work in progress. 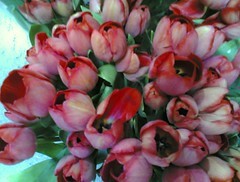 Yesterday I was admiring the armies of tulips that have appeared in the grocery store. (It is still too cold for spring flowers outside, although I have seen some promising leaf blades beginning to poke through the ground.) So when I decided it was time for another collage, tulips came to mind. I cut out the shape of the leaves from memory, and then used some of the colored papers that my daughter gave me to make the blossoms. I only had a short time to spend at Red Brick, but I enjoyed getting this little collage started. To be continued. . . . This is a photo I took today with my phonecam. I was leaving Barnes & Noble and about to start the car when I looked up and noticed that the shrubs directly in front of me had beautiful pink branches. (I must have seen those shrubs when I parked the car, but I was in a hurry and didn't stop to look.) 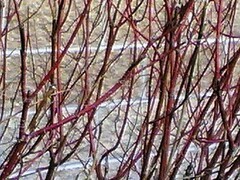 I loved the color, and the pattern of the branches against the the wall, so I got out of the car and took a couple of photos with my phonecam. Tonight I cropped one of the pictures to get the composition I wanted. Are branches against a wall important somehow? Not particularly, not even if they are a wonderful pink color. But what is important is remembering to stop and look at the world. If you pay attention, you might see something amazing. 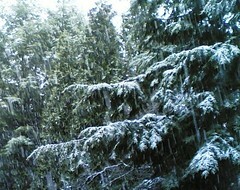 This is another of the photos I took with my phonecam during yesterday's snowstorm. This morning there was still snow on the ground, but most of it is gone by now with the temperatures rising to a tropical 37 degrees here in Beverly, MA. But I decided to crop this photo and post it tonight for all the folks in New Hampshire, Vermont, and Maine who are still digging out. Late this afternoon, we had a snowstorm! Come on already, it's April 4th! Although everyone seems surprised by this event, spring snowstorms often happen around here (north of Boston), and I have the photos to prove it! Nonethless, it is frustrating to have a snowstorm when we are all quite ready for spring weather! 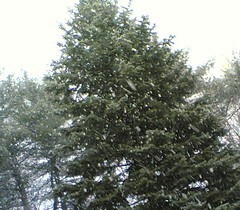 I decided I needed to change my outlook, so I used my phonecam to take pictures of the snow falling against the trees. The flakes were big and beautiful. The silver lining in this little cloud is that I have been trying all year to get a clear picture of the way the snowflakes look as they fall, and today I finally I had good luck. "They flash upon that inward eye/Which is the bliss of solitude; /And then my heart with pleasure fills,/And dances with the daffodils." Here is another photo that I took about this time last year, using my old phonecam with its soft little images. I came across it yesterday and decided to posterize it as well. 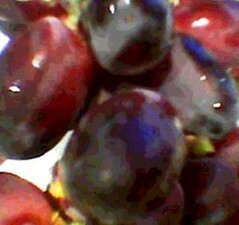 Grapes (fruit of the vine) just in time for Passover. Today I came across some pictures that I took back in early August of 2005, using my old phonecam. 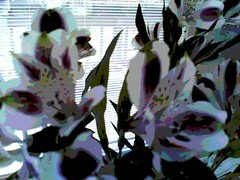 I loved my old phonecam for its soft, fuzzy images. In this case, I was trying to use it at dusk, to capture the look of the fading summer light through the trees, just as the electric lights come up on the streets. Well, this was all too much for the phonecam that I had at the time, and the result was interesting, but too indistinct to use. Posterizing sometimes seems to work well in such cases, so today I tried to posterized the image (with Painter IX). I also used a bit of digital pastel to make the two street lights slightly less intense. Anyway, I like the result, so here it is.